The REECHO curly hair extension is made from natural looking synthetic hair. 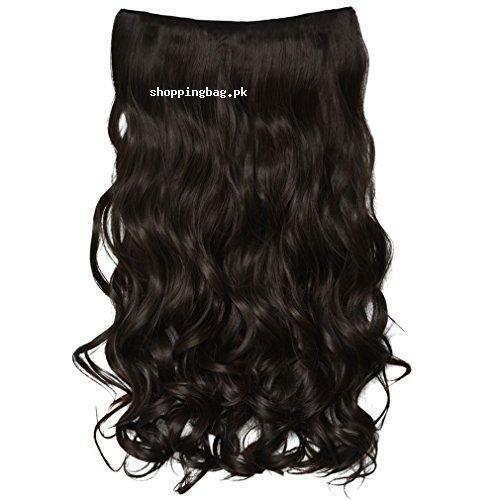 It is full head curly hair wig in Pakistan, which you can use 3 to 4 times. The deep brown hair extension can easily attach over your natural hair with clip-in closures. Elongate your natural hair up to 20 inches with imported quality hair extension. 100% MONEY BACK GUARANTEE - REECHO¡¯s items are all in the Amazon¡¯s warehouse in USA and your order will be fulfilled by Amazon. Amazon offers the RETURN or EXCHANGE service. If for any reasons, you cannot return the item, please contact with Amazon Customer Support by visiting : http://www.amazon.com/contact-us/ If Amazon still don¡¯t help you with it, please feel free to contact with Kevin for Help and Kevin will reply within 24 hours. UNLIKE the human hair,the synthetic hair fiber may get tangled after 2-3 wears because the synthetic clothes that build up static,especilly in winter.Besides,the dust and moisture in the air may hurt the synthetic hair fiber.To prevent it,kindly you can get a spray bottle and put some conditioner in it, then fill it up with water. Spray it in the hair extensions.It will make the hair extensions not very dry and prevent getting tangled in some extent. Please understand. EASY TO WASH AND TAKE CARE - Just need a little mild shampoo and hair conditioner then washing in lukewarm water.then set on a flat towel and let them naturally dry.If the hair fiber has got tangled,kindly you can use little bit of laundry detergent and the water to soak and wash rinsed out then use a little bit of fabric softener and water to soak for conditioning then rinsed and let it air dry. Please don t blow-dry and don t wear it when sleeping or swimming.